See the best of Vancouver’s North Shore on this tour that includes both the Capilano Suspension Bridge and Park and Grouse Mountain. 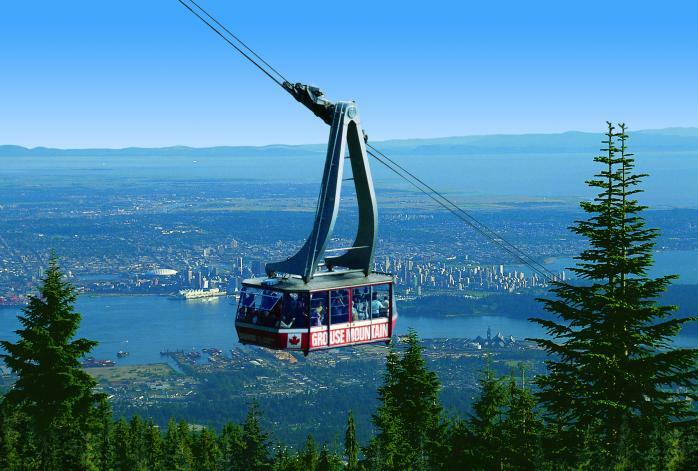 Tour includes an exhilarating ride to the top of Grouse Mountain aboard the Grouse Mountain SkyRide and admission to the world famous Capilano Suspension Bridge and Park. You’ll have access to the suspension bridge, the Tree Top Adventure and the new Cliffwalk, a cantilevered suspended walkway that juts out from a granite cliff thigh above the canyon. You also go to the Capilano Fish Hatchery to see the spawning salmon and trout in a setting which is stunning. All prices are in Canadian dollars and include tax, hotel pick up and drop off and all admissions. 9:00 AM Tour – 5 hours Adults $155, Children $95 Fish hatchery not included. * Lions Gate Bridge and Capilano Fish Hatchery: Get in touch with nature. * Capilano Suspension Bridge: A treetop adventure * Grouse Mountain: Summer Activities * Skyride to Grouse Mountain with breathtaking views * Theatre in the Sky “Born to Fly” * Chainsaw Carvings * Lumberjack Show * Scenic Chairlift * Grouse Mountain Grizzly Bear Refuge and more Capilano Fish Hatchery: Capilano Fish Hatchery: Designed to restore the dwindling stocks of Coho salmon, Chinook salmon and Steelhead trout, this hatchery produces over 1 million Coho, up to 2.5 million Chinook and 10,000-20,000 Steelhead every year. The salmon hatchery has extensive educational displays covering many aspects of the salmon life cycle and the functioning of the hatchery. Capilano Suspension Bridge: Often voted the best attraction in BC, the Capilano Suspension Bridge has, along with its 450 foot suspension bridge stretched over Capilano Canyon, a beautiful collection of totem poles and totem pole carvers, a rainforest nature park, a large gift shop and history centre. Grouse Mountain: Travel by gondola to the top of Grouse Mountain, a summer and winter mountaintop playground. Watch the movie “Born to Fly,” an eagle’s eye view of the area, in the Theatre in the Sky, ride the Peak Chairlift to the top of the mountain, eat in the café, shop in the gift shop or watch the logger’s show. Finally, visit the orphan grizzly cubs who now make their home in a habitat designed especially for them. or Email us or call 604-990-9299 or 800-913-9207 for more information and reservations.